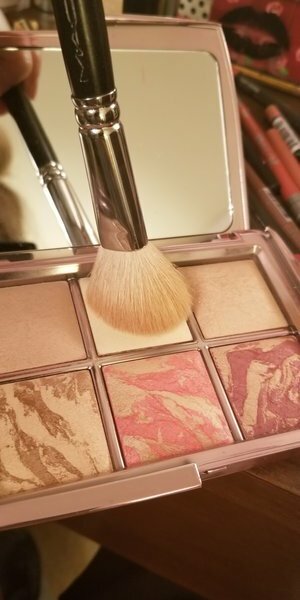 Brighten, contour, highlight, and finish with this 4-in-1, limited edition palette from Hourglass Cosmetics. Enriched with photoluminescent technology, Ambient Lighting Edit Volume 4 captures, diffuses, and mitigates harsh light to minimize imperfections for younger, healthy-looking skin. Just pop the travel-friendly palette into your carry on and jet off with glowing skin! High-tech finishing powders create a soft-focus effect to flatter skin in any lighting. Features 4 best-selling and 2 exclusive shades with 100% vegan formulas. Multi-use compact minimizes wrinkles, blemishes, and discoloration. First, apply Dim Light all over your face to finish makeup application. Follow with Diffused Light finishing powder, adding to the center of your face to cancel out redness and brighten under the eyes. Apply Filtered Bronze Light to your jawline, hollows of cheeks, and temples for warmth and definition. Use Luminous Glow on your cheeks for a healthy flush and Euphoric Fusion for an added pop of color. Swipe Euphoric Strobe Light on the tops of your cheekbones, center of your nose, and Cupid’s bow to finish off your glow. I am a sucker for these palettes! I never use the one I got last year and was really on the fence about getting this one. But I did and I am so glad!! I feel like it's the best of their shades and so useable for so many skin tones. I can't wait to travel this holiday season with this perfect face palette!! Having Dim and Diffused light in one place is so helpful and I hadn't tried the strobe powder or strobe blush before and was pleasantly surprised. 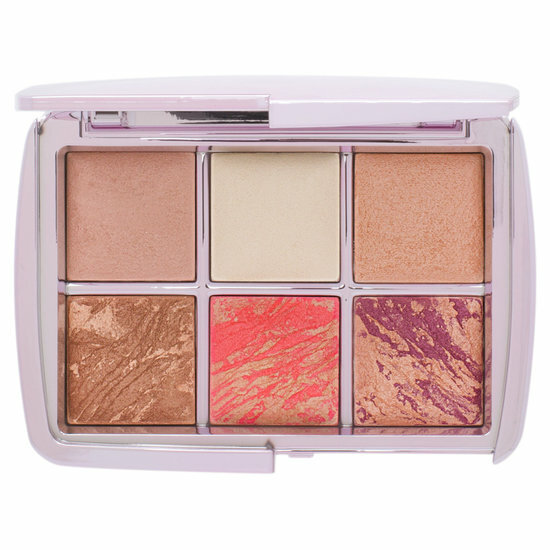 It's a great value palette and would make a lovely holiday gift as well! Good job Hourglass!! I ADORE this palette. It has everything I need for the face (except for a foundation/tinted moisturizer) and it is perfect for travel. I simply can't put it down! I always get compliments on how my skin looks. The powders are high-quality and long-lasting. I think it is a great deal for anyone looking to try even one of the powders, and honestly, I think this palette could last a while. I have a lot of makeup, and I always come back to this. 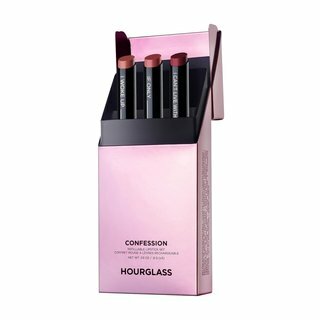 My first splurge on an hourglass product. Now I understand why people rave about this brand. Very subtle, very pretty. 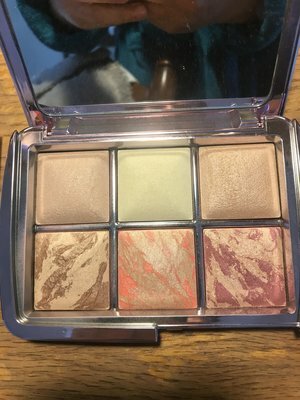 Perfect intro because it has everything in the palettes I need I even use the blush for eyeshadow and/ or to diffuse and blend harsh lines in my eyeshadows when I'm transitioning from different colors. I have no problem with the pan size (I've read some gripes) My Mac 168 is a perfect fit with room to spare. This is the first time I tried Hourglass powders. I actually just wanted to buy the Ambient Light powder but thought this palette would be a better investment to really get to know some other Hourglass products. I have to say, when I first opened my package, I was on the fence about the size of this palette. It really is a rather small size for the amount of money you have to pay for it. But when I started using the powders, I changed my mind. Each powder is very high quality and look so natural and flattering on the skin. The ambient powders make my skin look like satin. The highlighter is stunning as a topper on top of a blinding highlight (if you're into a blinding highlight of course). I'm not a big fan of blush because I feel like it just doesn't flatter me in a way. These on the other hand are now the ONLY blushes I use. They are subtle and look natural. I love the 2 shades as well! This palette is quite pricey but sooo worth it in my opinion. This is my first Hourglass product that I've tried. I wanted to explore their various products and I think purchasing one of their palettes is a good way, but once you figure out which products you like, I would not go for their palettes again because the pan sizes are so small; financially you are better off with their regular sized products. On the positive side, I did like almost all of the pans here (minus Dim Light). For reference, I am an NC 15-20 and it was too dark (I might try it again in the summer). The rest of the products, however, are beautiful on light skin! I understand now why their powders are so hyped. If you also have lighter skin tone, I would highly suggest this palette over the other one that was just released as well, because the finishing powders in that one are even darker. I think skin tone plays a crucial part in nailing the look with the finishing powders. I've read many people not liking them and from what i can tell, they did not select the right shade. I do disagree with Hourglass's marketing slogan where they state that all of their finishing powders suit all skin tones. They don't! If you are of lighter complexion, I would start with either Etherial Light (cooler undertone), or Diffused Light (warmer undertone) and if you are of darker complexion I would pick the darker powders. Once you've selected the right shades, I think you'll love these products! Both blushes are beautiful. The plummy colour reminds me of mulled wine with some golden highlights; it's a perfect winter shade! Sometimes, if I want to add a bit of warmth, I put the coral blush on the apples of my cheek on top of the plum. The bronzer is also beautiful on lighter skin tone (not too warm or dark like some bronzers can get), I think it's perfect for the winter season to add just a touch of colour to the face. The highlight is so finely milled and classy, you can see it, but it's not "in your face" at all, just the right amount. I found that it didn't over emphasised pores, but I still have to be careful with it. Diffused Light is absolutely stunning! I think that is my favourite so far! It really does blur out imperfections and gives a beautiful finish. Dim Light is the only one that I don't know what to do with. It just muddies my complexion if I lightly apply it, and if I put more, it makes my skin pink! I really dislike this colour, but will revisit it in the summer when I have a bit of a tan. This palette is beautiful, but the shade Luminous Glow barely had any pigment to it in the palette I received! 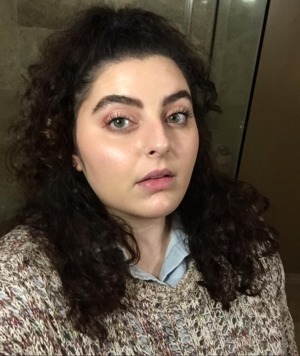 it was mostly the highlight shade not at all like pictured or what I others reviewing, I know with the mescolare or marbling of the product you can get variations but this seemed like I got a dud, I tried it on the cheeks and it barely had any color to it (I'm light/medium skin tone), normally I wouldn't fuss so much, but this palette is $$$! I spoke with beautylish customer service (which is always a pleasure, they truly are amazing) and they kindly sent me another one once I shipped backed the old one, shipping was lightening fast and came almost the next day! But the 2nd palette had the same thing with the blush having no pigment! I'm just going to keep it at this point, all the other colors are stunning and I'm sure I can use luminous glow as a mixer, just be aware that this can happen I guess...I've never had an issue with hourglass pigment until now. The unlocked palette is my favorite of life at the moment, and all of the individual blush/bronzer/highlight products are absolute staples in my collection, not trying to hate on hourglass, they're one of my absolute favorite brands, just felt a bit disappointed in this one. This is the first time I've ever tried Hourglass powders. I figured this would be a better way to try a variety of them, considering the single pans are expensive as well. As soon as I got the palette, I opened it and used it because I was just so excited! First off, let me say that the packaging is SOOOO luxurious - the reflective purple compact is so sleek and beautiful! It's very sturdy and doesn't feel cheap at all. What's inside is truly what's worth the money... these powders are easily the best I've ever tried (and I've tried A LOT of powders!!!). Dim Light and Diffused Light are perfect for setting the under-eye; they are so smooth and buttery and get the job done when it comes to setting makeup! The highlighters, blushes, and bronzers are also unbeatable! They put the most gorgeous sheen on the cheeks without looking "cakey." I will admit, I was a bit worried about what others have said regarding the pan size, but I find that they have plenty of product. Overall, I will be repurchasing these powders when (if ever!) my palette runs out! Hourglass does powders perfectly. Every shade in this palette is pigmented and radiant without noticeable glitter. 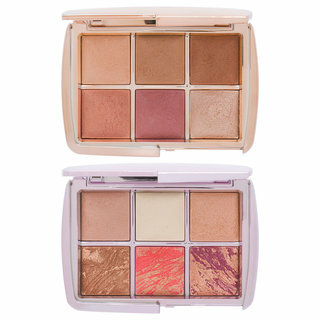 This is a total must have and one of the best ambient palettes to date! 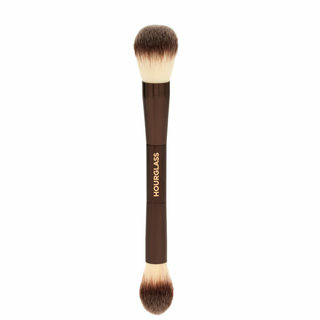 I adore the hourglass products, but this is an all time favorite! I wish hourglass would release one of the Edit palettes every few months rather than just during the holiday releases. It's perfect for travel too. This product is so beautiful. I love that it's not super heavy and it just melts into the skin so naturally. I'm mid 30s and have very dry skin with texture and this make me look flawless. It's a very natural luminous look so if you like extremely pigmentated products this is not for you. This is my first Hourglass palette and I'm so glad I bought this. I'm pretty sure brand is my new HG. I've downsized a lot of my makeup and after receiving my products I think I can downsize more. My other products were ok, but compared to this? Wow. HG has definitely nailed it and I wish I would have purchased them before. This is truly everything I have ever wanted in a product.